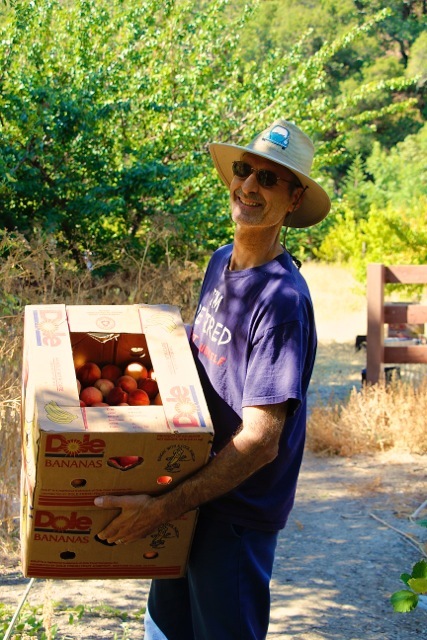 Vince started volunteering with GleanSLO at the beginning of 2013. At that time he fearlessly approached many of his neighbors to ask if they’d like to donate their excess fruit. This is when we had some of our FIRST Neighborhood-wide Collections! Now Vince is a seasoned Neighborhood Harvest Leader. Thanks for all or your great ideas, Vince! Keep ’em coming! I’m a scrounger by nature. I like to take things that other people don’t want and find a use for them, giving them a second life. Before I found GleanSLO, as I would walk around my neighborhood I was bothered by all the fruit that was falling on the ground and rotting. I thought that there must be a way to save this fruit. I thought about starting a neighborhood produce exchange. That was just about the time I found out about GleanSLO. So I called them and volunteered. I saw a GleanSLO flyer somewhere, can’t remember where. So I called the number on the flyer and took it from there. My favorite part is participating in a group activity with others who share my enthusiasm for the task at hand. I tend to be more of a loner, not fond of team or group activities. But I’ve found that gleaning is an exception for me. Gleaning gives me great satisfaction, and here’s why. The corporate food industry has made it its mission to sell us cheap, unhealthy food (or food-like products) that maximize their profits, while paying lip service to our health. Meanwhile, they demand and get government subsidies from self-serving politicians. When I glean, I’m helping to provide healthy food, at no cost, to people who need it but can’t afford grocery store prices. Gleaning completely bypasses corporations and government while contributing to the betterment of our community. That makes me very happy. This entry was posted in Uncategorized on 08/28/2014 by gleanslo. Enjoy our July 2014 edition! 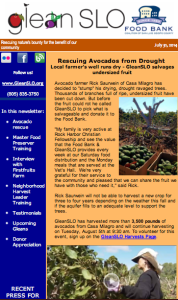 This entry was posted in Archived Newsletters on 08/27/2014 by gleanslo. Avocado farmer Rick Saurwein of Casa Milagro has decided to “stump” his drying, drought ravaged trees. Thousands of branches full of ripe, undersized fruit have been cut down. But before the fruit could rot he called GleanSLO to pick what is salvageable and donate it to the Food Bank. “My family is very active at Rock Harbor Christian Fellowship and see the value that the Food Bank & GleanSLO provides every week at our Saturday food distribution and the Monday meals that are served at the Vet’s Hall. We’re very grateful for their service to the community and pleased that we can share the fruit we have with those who need it,” said Rick. Rick Saurwein will not be able to harvest a new crop for three to four years depending on the weather this fall and if the aquifer fills to an adequate level to support the trees. GleanSLO volunteers harvested more than 5,200 pounds of avocados from Casa Milagro and donated 214 volunteer hours to salvage the fruit. This entry was posted in Farm Harvests on 08/27/2014 by gleanslo.